If you want the fastest, most secure website, take advantage of a dedicated managed server in the Cambridge hosting centre. Unlike shared hosting services, only your site will be running on your dedicated server. This is more secure (as other hostees cannot attempt to access any of your data) and quick (the server will be doing nothing besides serving your website as fast as possible). A dedicated server offers all the features of our Advanced hosting package. The server will be fully managed by us, so you do not need any special knowledge. 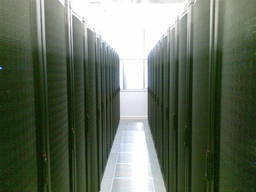 The hosting centre is fully air-conditioned, generator-backed and has high security keycard-only entry. We support NetBSD (i386 and amd64), Windows and Linux hosting. All managed servers run NetBSD/amd64 (64-bit). For resilience and backup purposes, we prefer to run dedicated servers in Xen (but with only your virtual machine running on the hardware). Pricing will depend on average bandwidth and required server specification. Prices start at £25 per month for a fully-managed virtual server with 25GB transfer per month, 1 IP address, 1024MB RAM, 10GB of disk space and ssh shell access (with a setup fee of £150). Unless otherwise stated, contracts are for 12 months payable in advance. Please contact us for more information.